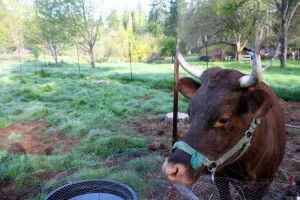 We have a cow at Misty Meadows! Her name is Stella. She is not our cow. She may or may not be pregnant. She got out only once (actually, right where she is pictured) and was only captured when lured with collards. She is mowing our fields and perimeter like a true champion. Sometimes she looks angry, sometimes pleased. Hard to tell really. If you’d like to meet her, come out to buy some plant starts (hint, hint).